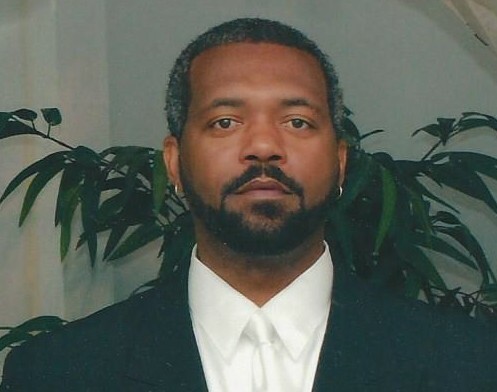 Mr. Derrick Foxworth, 47 of Orrum transitioned from time to eternal rest on April 2, 2018 at Southeastern Health. He was born on November 9, 1970 to the late William James and Bertha Mial Foxworth. Derrick graduated from South Robeson High School in Rowland, NC. After graduating he enlisted in the US Marine and served for four years. Derrick was employed by Alamac American Knitt for several years until their closing in 2016. In 2009 Derrick met the love of his life, Eugenia Page. In 2011 they were united in Holy Matrimony. Derrick was preceded in death by his parents and one bother, Gregory Foxworth. He leaves to cherish his fond memories, his wife, Eugenia Marie Foxworth of the home, one daughter, Derrickah Janae Foxworth of Purvis, NC; four brothers, David J. Foxworth, Michael L. (Shirley) Foxworth, William C. Foxworth and Eddie B. Foxworth all of Rowland, NC; other sister-in-laws, Traci Foxworth of Lumberton, NC; Dorothy (Isiah) Marlin and Angela Pope of Winston Salem, NC; Gwendolyn Blackman of Knightsdale, NC; one brother-in-law Donald (Angela) Pope of Winston Salem, NC; one uncle, Henry (Pinese) Mial of Knightsdale, NC; two aunts, Lela Thompson of Lumberton, NC and Maurice Mial of Raleigh, NC and a special cousin Jerry (Constance) Hines and a host of other relatives and friends.